DDA launches dual-purpose website for CWE tenants and multi-family property owners. From our first project kick-off call, it was clear that the principals at Commercial Water & Energy (CWE) were unhappy with and had outgrown their old website, which they had designed by a different company in 2005. Frankly, they felt as though the only usable content on the entire site was the landing page and account login. It was an outdated site that needed a new structure and aesthetic to better align with the company’s branding and sales goals. The challenge was to reinvent the company’s online presence and help them reach an expanded target audience of project managers, developers, and property owners of existing and new construction multi-tenant communities. Before contacting DDA, CWE generated the majority of their business by referrals. A primary objective for the website redesign was to generate new business through the website. However, the old website was not search engine optimized and did not rank well for key terms related to submetering, utility allocation, and web-based utility billing systems. For the website redesign, search engine marketing was an important objective. CWE’s new site needed to appeal to both tenants, so they could easily make utility payments, and property managers, so they could understand CWE and access their manager portal. One of the main content objectives was to go beyond an explanation of what CWE does, and instead, elaborate on what CWE does well. Hone in on the key aspects that help CWE win contracts and push those aspects to the forefront. 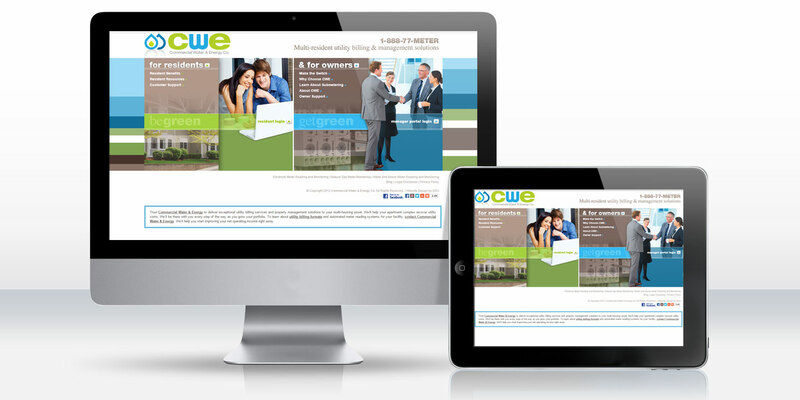 DDA created a unique corporate identity for CWE, from a revitalized logo design to an aesthetically pleasing website design with colors that tie in nicely to the water and energy theme. Keeping both the tenant and property owner in mind, DDA developed this dual-purpose website so that it clearly delineates the functions and features available for each user type. All content was search engine optimized for a long list of terms related to the utility billing business. Tenants can pay their utility bill online and property managers can review their portfolio at a glance through two distinct and prominently placed logins. DDA programmed a blog for the website that enables CWE administrators to post information about networking events, what makes CWE a leader in the field, and much more. Plus, social media features within the blog help spread the word virally. DDA launched the new website in time for two major trade shows where CWE planned to be in attendance and an email blast that CWE used to promote their business.